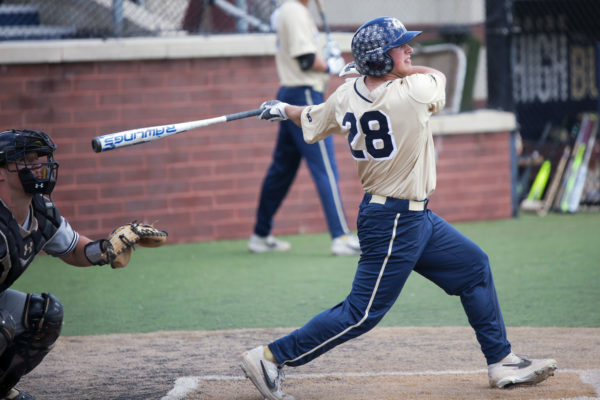 Junior utility player Heath Faulkner attempts to block a Navy player. The Colonials beat the Midshipmen 14–8 to take Friday night's game. 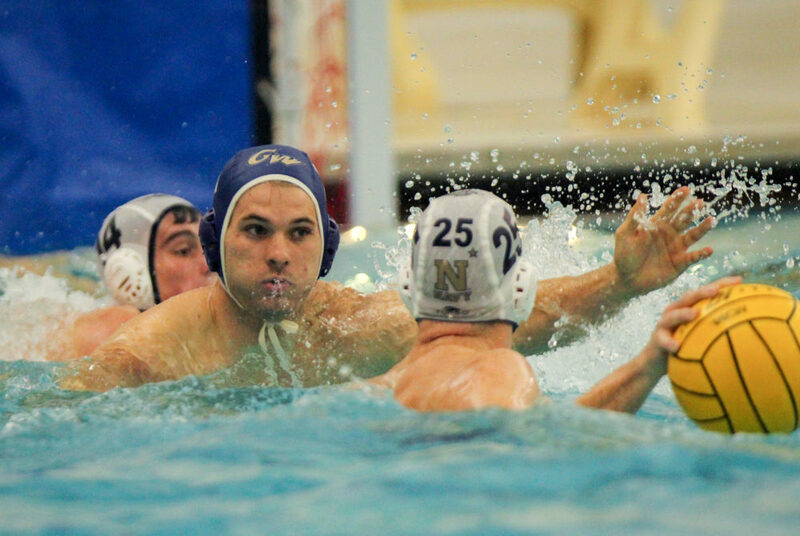 Men’s water polo won a contentious game against Navy Friday night at the Smith Center. Coming off two straight wins against Austin College and Connecticut College, the Colonials (16-5, 6-2 MAWPC) defeated the Navy Midshipmen (12-9, 4-3 MAWPC) 14–8 to remain undefeated at home this season. The night was marked with a special ceremony prior to the game, in which the team unveiled their 2017 Mid-Atlantic Water Polo Conference Championship and NCAA Tournament banners. Junior center Andrew Mavis – who tallied three goals in the game – said the banner reveal was a confidence booster for the team. “It’s always motivation to us to see that go up and continue to win and hang another banner,” Mavis said. The game marked the team’s first conference matchup in nearly two weeks, but they did not miss a beat, scoring five goals in each of the first two quarters. In addition to the goals from Mavis, five other Colonials found the back of the net in the first half, including two each from sophomore utility player Andras Levai and senior utility player Jack Kerwin. Emotions ran high for Navy and reached a crescendo two minutes into the second quarter, when Navy head coach Luis Nicolao was issued a yellow card by the referees for disputing multiple play calls. The Colonials continued to pull ahead following the incident, cruising into halftime with a 10–4 lead. Junior utility player Atakan Destici came alive in the second half, scoring two goals in the third quarter and assisting a goal by Levai. Destici dished out a team-high five assists in the night. Destici’s three total goals extended his reign as team goal leader, giving him 64 goals on the season. Senior goalkeepers Austin Pyrch and Matt Taylor shared time equally in goal, with Pyrch playing all of the first half and Taylor playing all of the second. The two combined for 20 saves in the game. As time wound down in the third quarter and the team held a commanding seven-point lead, head coach Barry King made significant changes to the lineup, bringing in three freshmen and a sophomore, leaving Kerwin as the only original starter in the game. Coming off a career-high four goals in the win over Connecticut College Sunday, senior utility player Zach Slaughter continued his streak of dominance with two goals against the Midshipmen, including one to round out the fourth quarter. King said the team succeeded in not playing down to the level of their opponents, a point of emphasis for the team in recent weeks. Jumping out to the early lead was key, as the team was able to play effective defense which led to a total of 10 steals and 6 blocks. Navy was held to just two goals each quarter as a result. King stressed the importance of a win like the one against Navy for maintaining momentum heading into a two-week break in the schedule. The Colonials return to action Nov. 4 when they host a doubleheader against Fordham and Wagner.